Arlene “Kaka” Bag-ao is the current representative for the AKBAYAN party in the 15th Congress of the House of Representatives of the Philippines and the current Legislative Liaison Officer for the Lone District of the Province of Dinagat Islands. She is a 2006-2007 fellow of the Hubert H. Humphrey School of Public Affairs. In the House of Representatives, she is a member of the Appropriations Committee and the Senior Vice Chair of the Agrarian Reform Committee. She is also a member of the Justice, Land Use, Mindanao Affairs, Human Rights, National Cultural Communities, Constitutional Amendments, Population and Family Relations, and Women and Gender Equality Committees. She was the lead counsel of Sumilao farmers, a group that walked 1,700 km to Manila to claim their lands from one of the biggest corporations in the country. The successful campaign symbolized the struggles that Representative Bag-ao consistently champions—that laws should not be a monopoly of the educated and rich, but an instrument of empowerment for the poor and voiceless. 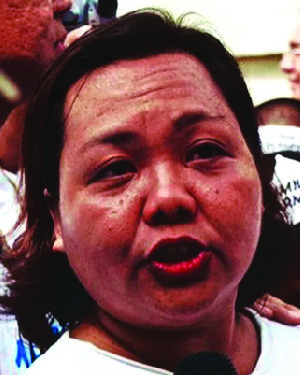 Outside of her formal work, Representative Bag-ao is an alternative lawyer and a human rights advocate. She is active in various alternative law groups that work for the advancement of the rights and welfare of various marginalized communities, especially women, farmers, fisherpersons, and indigenous peoples. As Convener of the Alternative Law Groups until 2007, she worked with the Supreme Court to implement judicial reforms that would increase the poor’s access to justice and pushed for the institutionalization of several social justice agendas. She is a recognized leader in the development community in the Philippines. Representative Bag-ao adapts amazingly well to diverse cultural contexts and is remarkably driven with a special gift of motivating others through her personality, passion, and experiences. Her leadership skills, positive energy, and sense of humor are infectious and follow her everywhere she goes. In naming Representative Bag-ao as a recipient of the Distinguished Leadership Award for Internationals, the selection committee cited her extraordinary leadership and commitment for public service. She consistently shows outstanding leadership qualities and the commitment to service that enable her to contribute significant reforms in her field of work, in particular, and to the Philippine society, in general.